The High Tatras are often referred to as the "smallest high mountain range in the world". But as this granite island surrounded by flat valleys to the North and South proves, small need not mean unimpressive. 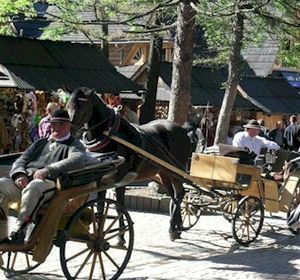 The centre of Polish alpine activity - and the Poles are passionate about their Alps - is the charming spa town of Zakopane, which enjoys world-wide fame. 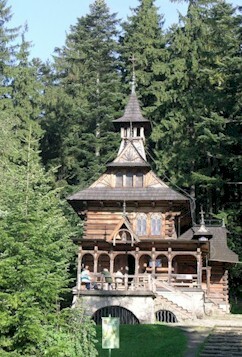 Hardly another anonymous alpine spa, Zakopane is a unique mixture of local folk art and Nouveau style Viennese art thanks to Polish artists of the 18th century who used to come here. A wide variety of rock formations (granite, limestone, dolomite and gneis) come together in the Tatras, which boast a correspondingly large variety of flora and fauna. Chamois, marmots and even brown bears call this area their home, sharing the steep hillsides and attractive valleys. The following programme makes it possible for you to get a first-hand experience of the natural variety here. It might not be a bad idea to first use the Beskid mountain hike to acclimatise yourself and get into form so that you can breeze through the higher Tatra tour. Of course, it is also possible to book only this tour or to combine it with one of our cycle tours. Arrival in Zakopane and check into Hotel Bialy Potok, a comfortable and conveniently located hotel complex (***). You will only be 20 minutes (on foot) from Zakopane's main promenade, the Krupowki. And in fact, passing by right behind the hotel grounds, is a hiking trail to the Dolina Bialego, one of the most beautiful forest valleys of the region. We can recommend this short walk amidst dolomite rocks, small rapids and old spruce, fir and beech trees for the afternoon. The terrain here is gentler and the mountains themselves much lower. The main ridge, however, does reach above 2000 m. Our hike begins in the Dolina Koscieliska valley, perhaps the most beautiful valley of the Tatra. Erosion by the many brooks has created fantastic rock formations and caves. One of the most beautiful locations is the Krakow Gorge reminiscent of the buildings of vintage Krakow. Easy hiking trails lead to mountain pastures and the Czerwone Wierchy (Red Peaks) overgrown with colourful grasses. After climbing the Malolacyniak (2096 m) we descend to the exit of the Strazyska valley, a favourite with walkers. 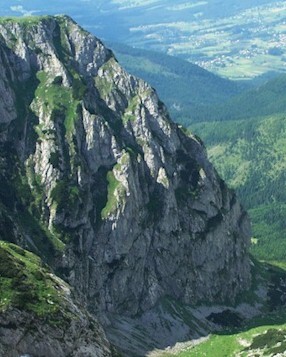 It is also possible to make a detour to Giewont (1894 m), arguably the most striking peak of the Polish Tatra mountains. Today we will be going to the Roztoka valley, which is in the form of a deep and narrow gorge. Its upper extension ends in the completely differently formed Dolina Pieciu Stawow Polskich valley (Valley of the five Polish Lakes). Its varied and bizarre appearance is due to the slow movement of ice age glaciers that carved out this post-glacial terrain. The 70 m high Wielka Siklawa, the largest waterfall of the High Tatras, crashing down a high threshhold dividing the two valleys. Finally, we hike through either the Swistowka valley basin (1763 m) or the Sypiglasowa pass (2110 m) to get to the legendary lake, Morskie Oko (Eye of the Sea), the largest and most famous of the High Tatra lakes. A truly bewitching corner of the earth, autumn is even more full of colour with dark green mountain and stone pine trees, bright red grasses, a light green lake surrounded by white boulders and black rocks under a dazzling blue sky. Two mountain huts provide the ideal setting for you to catch a breath and take in the view. Your return journey to Krakow can be at any time you choose with one of the many bus or trains available. The exact time of departure will be individually discussed on location and you have the choice of either travelling home or of extending your stay in Krakow. 3 overnight stays with breakfast and dinner in hotel Bialy Potok (***) in Zakopane. All rooms have their own shower and bathroom. 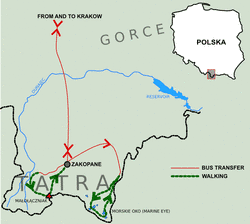 2 transfers by bus: Krakow- Zakopane or Rytro - Zakopane as the case may be, Zakopane - Krakow. Lending out information material: Hiker's routes with detailed descriptions of the many available options. In case of bad weather or if you are a bit under the weather we have information about how to return using public transport. Lunches, small expenses on location: admission tickets to national park and museums, rides using public transport. *Prices are calcullated in EUR but other currencies are accepted as well. You can download full list of USD-prices and GBP-prices. We also accept credit card payments (Visa or Mastercard).